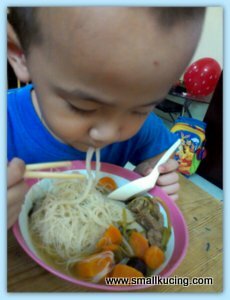 Some time ago, Mamarazzi saw Uncle Arthur blog posted about Prawn Noodles. She suddenly felt like having prawn noodles pulak. But too bad Papa was not around. But in the fridge, there was some frozen prawns. Mamarazzi did it it a bit differently. She shelled the Prawns and used the shell to boil the soup. Hmmm ...she should have fried them a bit to give it more taste. As per Unce Pete's blog, chopped some shallots. Don't have curry powder so Mamarazzi used Cili paste. No kangkung(water spinach?) so she replace with Sawi(Mustard green?). 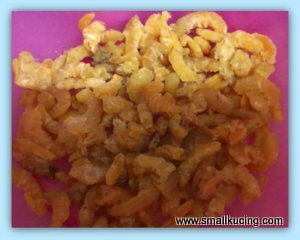 Some dried shrimps. Fried it with the shallots, chili paste, a bit of oyster sauce and bit of salt. Then pour it in the boiling soup. Boiled awhile. Aiks...too spicy so she added a bit of sugar. 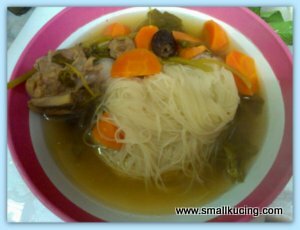 while the soup was being boiled, she soak some bihun( vermicelli) in hot water. 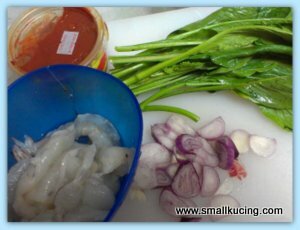 She throw in the prawns and the bihun into the soup. Boil around 3 mins and TADA!!! Can eat liao. According to her taste not bad lah. 50% passing mark la. As for me, I end up eating weird Bihun soup. We had Water Crest Vegetabe soup for lucnh. There was still a big pot left for dinner. As I can't eat spicy prawn bihun, Mamarazzi dump some bihun into the Water Crest Soup for me. MMm....this combination tasted not bad. Quite nice. At least my tummy is fed . So many prawns, not enough ingredient kah? Looks good to me... No need follow law one, can always cook up own recipe... Not the same, never mind. May even be nicer! I also do the same.. I take some bihun and cook with my soup of the day..
the prawn bihun looks good. is only 50%? Mommy Meow sure clever substituting items she found in her kitchen to make the prawn noodle. yummy! I love bihun soup..
Meow's title for this post is very catchy la. My sista Yan told me to check it out here because she saw the word "Quickie". Aiyah she very sensitive nowadays, kena ahemization. I told her meow's entries very decent one, got 1 kitty cat and food only. No ahem ahem, mutated mushroom, drag queen or sort of. actually i had the same thought when i saw the title, it's fried beehoon with prawns that appeared in my mind.. never thought this mamarazzi so "geng chow" go and cook "har mien".. 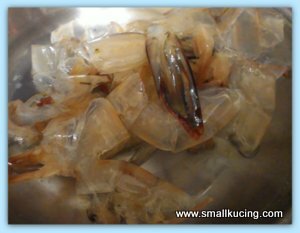 Shell the prawns and recycle the shell to make the soup? 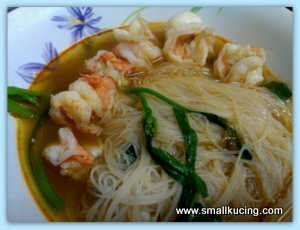 Is that how to make prawn noodle soup? I must try this one day. No need chicken or pork broth? prawn meeeeeee one of my fav back then... nak sikit!! Now your mamarazzi is very pandai to masak liow! I dont mind having a bowl of prawn noodles now... so hungry at this moment.. 1.50pm! Now....u r tempting me to get a bowl of prawn noodles. Not bad what....small kucing's mee hoon soup is delicious with that water crest soup. Meow, your har mee looks good, but I like the soup more reddish. I don't think I want to try cooking this at this moment, because we just pay RM2.50 here, we can taste a very nice har mee already. Yum, I do the same too, the shells brings out a wonderful flavor. Kathy - check with oongui whether anything wrong with his blog, tried going in but warned about virus. wah, this mamarazzi always trying out new things in her kitchen, so experimental lah!! prawn noodles use curry powder one meh?? i thought use chili paste or sambal?? hahahaha, too bad small kucing cannot take spicy food!! no choice can only resort to something secondary lah.. meehoon with watercress soup also not bad mah, although the appearance doesn't look good lah.. Simple but looks so yummy!! We also love "sai yong choy" soup but few days ago, I stir-fried this veggie (watercrest) and it was delicious too! Mmm..sedap. Mamarazzi can really cook. Looks good to me.